I've been feeding garden hedgehogs outside for years, but this year I decided to build a hedgehog feeding station because of the large number of cats in the local area. I was putting food out last year up until early December, but because of the cats, I was putting a lot of mealworms out, and not so many cat biscuits. During this time, I found a young hoglet, that weighed in at only 500g which is much too small for a hedgehog to survive hibernation; ideally they should be at least 700g. If they go into hibernation without enough fat on them, they will not survive the winter. I took the hoglet to Withington Hedgehog Rescue and told them about my dilemma with the cats. They suggested that I build a hedgehog feeding station, which has the added advantage of enabling you to leave some dry catfood available through the winter, for any occasions when the hedgehogs might wake up for a short while to seek out food. I also learned that whilst the hedgehogs love mealworms, it's best not to provide too many as the hedgehogs will happily eat the mealworms to the exclusion of everything else. 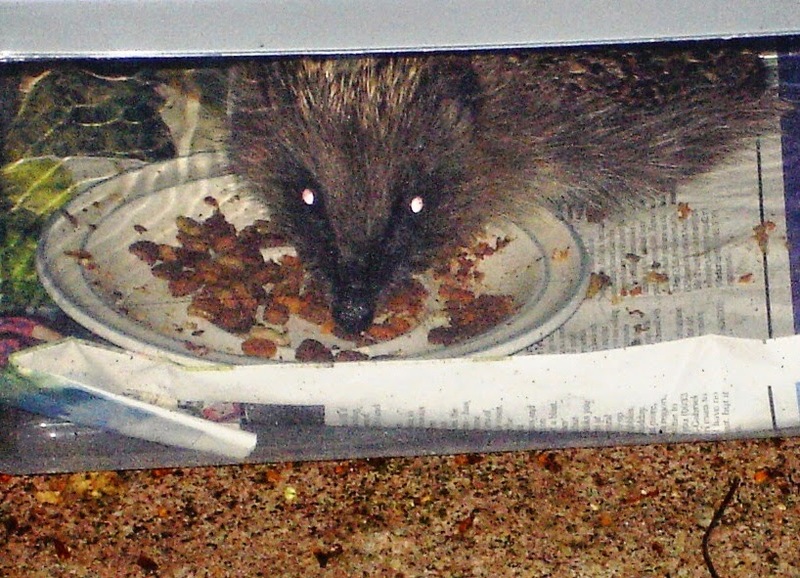 I have noticed that the hedgehog will pick out the mealworms during its first visit of the evening, then will return later on to eat the biscuits, presumably if there's been nothing better available in the undergrowth (although the garden is FULL of snails, and is chemical free). There is a lot of advice online about what food to put out for hedgehogs but do remember that the old wives' tale about them liking bread and milk is a dangerous myth as they are lactose intolerant. Bread and milk will make them ill. I've offered a variety of foodstuffs in my hedgehog café including hard boiled egg, which got a big 'no thanks' as well as crushed unsalted peanuts and sunflower hearts. Dry, chicken flavoured cat biscuits with a sprinkling of mealworms seems to be the favourite. 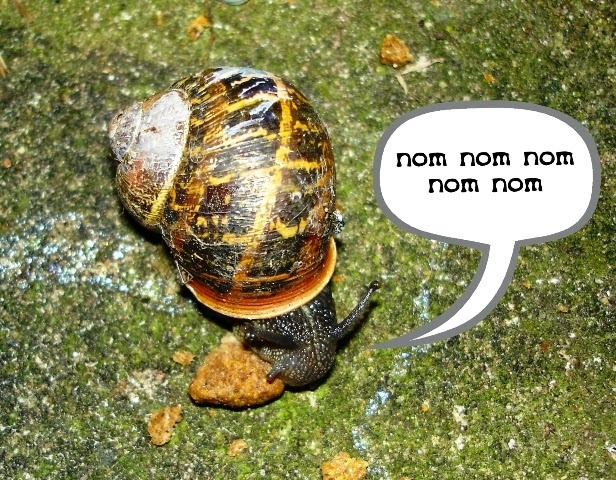 Even the snails like them. So, that's enough about what to feed the hedgehogs. Here's a slideshow that I made showing you how to make a place to feed them. Please also make sure that you leave drinking water available for hedgehogs. I haven't put the drinking water inside the feeding station as the hedgehogs walk through everything and can make a right mess, but there is a bowl of water immediately outside the box. "An easy way to cut the entrance is to drill a hole in each of the four corners. You need a fast drill and some wood. Put the wood against the plastic and drill through the plastic into the wood. You can use a bit of cardboard cut to 10cm x 10cm as a template and mark the corners with a permanent maker. Use just a junior hacksaw blade (£1.50 for 10) and saw from hole to hole." This hog no longer needs to sit in its dinner to keep the cats away!